Phuket is one of the most celebrated islands in Thailand located at the Andaman Sea with some of the most beautiful beaches in Southeast Asia. It is no wonder the place is usually swamped with travellers on a weekly basis for some sun and sea action. As Bangkok is the central city of the country, it only makes sense that people would travel back and forth to Phuket from there. The best and most common way to get around is by bus and Phuket Travel 2 is always set to help build a new memory for you. This starts with a bus ticket booking through Easybook's easy-to-use website or you can download our mobile app to purchase it within minutes. If you are travelling from the capital city of Thailand, your Phuket Travel Tour pick-up will be located at Phuket Bus Terminal in the Mueang Phuket District of Phuket and Southern Bus Terminal or also known as Sai Tai Mai if you leaving from Bangkok. Make sure to book your bus tickets in advance especially if you are travelling over the weekends or during holiday season. 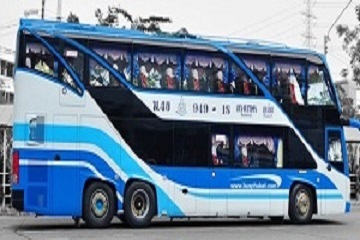 Phuket Travel comes with a standard express bus and the VIP bus for you to choose from. Standard 2+2 seating arrangement can be found on the standard express bus, while the VIP bus comes with the 2+1 arrangement. Their VIP bus services are more well-received as it allows the passengers to have more legroom space. Also, the journey takes about 12 hours, so you would want to be as comfortable as possible. Phuket Travel Tour coaches are equipped with air-conditioning systems, a steward and a toilet. Complimentary water and muffin will also be provided while you are on board with the bus operator, as well as free food during a rest stop that is only available before midnight. So naturally overnight bus would not be able to enjoy this meal. Make your travel plans less complicated now that you can book your Phuket Travel 2 bus ticket online through Easybook website. With very easy steps to navigate through the website, you will be able to obtain your electronic tickets within minutes. You can also download Easybook's mobile app to your phone so you can buy the Phuket Travel Tour ticket anytime you desire.